Although the Mayzville storefront in Brownsville is closed, my studio is thriving in both Oregon and the Bay Area California. 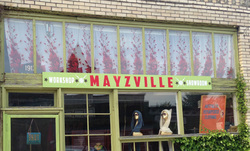 ​I opened Mayzville in Brownsville Oregon in February of 2013 as my workspace, showroom and office. This spectacular building, built in 1912 was the home of the first woman Pharmacist to graduate the University of Oregon. The high ceilings and southern exposure create a space that is enchanting and charming. Predominantly positioned near the cross streets that make up the downtown commerce area in Brownsville, this building is one of Brownsville's jewels. The beauty of the surrounding area, the town of Brownsville and the building add to the creativity that is now the new and permanent home of my workshop. My designs are shown exclusively at the Oregon Country Fair in Veneta Oregon in July each year. For More information check out the OCF website, and come see me in the Cela Mela Meadow in booth M72.